Zenoss is a open source network monitoring system. If you have ever downloaded the vmware virtual appliance to run as a virtual machine then you might find getting the correct time to show on the zenoss dashboard can be tricky, especially if you have no experience with the linux os. One way to quickly update the time is to log into the virtual appliance web interface and change the time there. To bring up the web gui go to http://x.x.x.x:8003. The default username and password is admin and password. From the left menu select Configuration , then Time zone and Time. 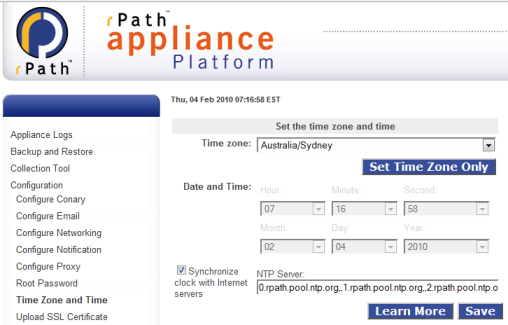 Update the zone, ntp servers and change the time as needed. You will need to restart zenoss for the changes to take effect. Alternatively, if you're still having problems then you can also try enabling the synchronize guest time with host option in the vmware tools settings of the vm. On ESX this can be found via edit settings, options tab then vmware tools.